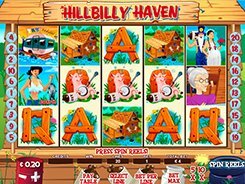 This video slot developed by NYX shows the things that are the stereotype of a hillbilly, a guy who enjoys a simple urban life, far from the hustling cities. So on the reels you will see a long-bearded man carrying a moonshine bottle, a car mechanic lighting a cigarette, a shabby trailer, a drunk pig playing the banjo, and more. The slot has 5 reels, 20 paylines, a wild, a scatter and two bonus symbols. A bet is configured in a wide range between $0.1 and $2000, so the game will be very appealing for high rollers. The biggest prize you may grab in the game reaches 2000 coins or $200,000 if playing the maximum stake. An automobile symbols acts as a free spin trigger, and all you have to do to unlock 5, 10 or 20 free spins is to hit at least three automobiles across a payline. There is also a wild symbol represented by a crocodile. The wild replaces for other regular icons and pays out up to $100,000 for five of a kind. PLAY FOR REAL MONEY!